On the day that Miao Zi Shou is born, Miao Zheng gets the responsibility of holding the water hose or being a “miao zi shou”; Because of an urgent duty call, Miao Zheng, who had accompanied his wife for 30 hours, misses the moment when Ah Shou is born; It is also because of this urgent call that the name of “Miao Zi Shou” is coincidentally given to the child. Due to the fact that the work of being a “miao zi shou” is not a role that the public is well acquainted with, Ah Shou has no idea that his name has such deep ties with firefighting. 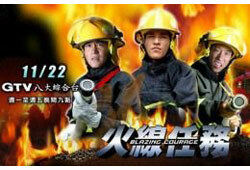 Until he accidentally participated in a fire fighting operation… Because of this feeling of honor and the coincidence of his name, he changed his original career plan… Miao Zheng sealed away all the past events in his life and has never spoken a word about his wife… Ah Shou, who becomes a firefighter, had no idea that his father used to be an outstanding firefighter in the fire team. Changing his career from being a veterinarian to a firefighter, Ah Shou’s blood flows with the same enthusiasm as his father and it is because of this that he would continuously discover the value and meaning of life in his firefighting work. It is also this work that leads him to the criminal that started the fire that caused the death of his mom! The story starts from the acquaintance of Li Jia Jia and Miao Zi Shou and also starts from the acquaintance of Tang Han Sheng and Zheng Yun… Li Jia Jia is a news anchor and once, during an event, she missed the opportunity to be the main news anchor. However, she accidentally gets acquainted with Miao Zi Shou who came to her rescue; Tang Han Sheng happens to be the member of the same team as Miao Zi Shou and they are both filled with enthusiasm towards the work of a firefighter. Yet their personalities are totally different. It is also because of Tang Han Sheng’s cold, ruthless and hard to get close to attitude that brought about the competitive relationship between him and Ah Shou. Until Han Sheng meets the caring and compassionate Zheng Yun during a “dog disaster” and falls in love with her at first sight. With the gradual awakening of Ah Shou’s childhood memory on a big fire that happen when he was a child, the three young guys, with their wisdom and courage, faces test after test of fire disasters and shoulders the responsibility of being in the “line of fire.” With the development of the story, follow through all the characters’ love and joy, happiness and sadness. What you will see is scene after scene of the real life activities of firefighters and see all the different kinds of phenomenon that are in society. You will also see the love between father and son, the loyalty between colleagues and friends, the love between husband and wife and boyfriends and girlfriends… scene after scene that will be played out in the drama. soon and check out my site too.